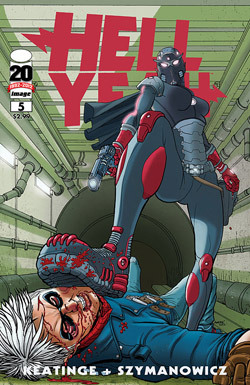 When I picked up the first issue of Hell Yeah, by Keatinge and Szymanowicz, a few months ago I didn’t know what I was getting myself into. And though this article will be reviewing the final issue of the first story arc, I will have to say that if you have not read this series than you should jump into it with as little knowledge as possible because this is one of the craziest and most fun you can have with a comic book. Hell Yeah tells the story of Ben Day and the worst day of his life. That day being when he finds out that throughout the multiverse all other versions of him are being killed off and that he’s one of the last versions of himself. Why are other versions of Ben Day being killed off and who is doing this? In this issue we get some answers to some of the questions that have been raised through the series so far, but like all comics not everything is answered. Keatinge drops enough information to keep the reader interested to future issues. Hints of Ben’s parentage are brought to light and the motivations of why are touched upon. And the most important thing to happen in this issue is to show what the book will ultimately be about. Which does sound a little strange but believe me it will make sense when you read it. Image Comics has been having a standout year for launching original and creative comics, see Fatale, Saga, Revival, and this comic is exception. With a fun and complex first arc introducing the main character and bringing him to the point where the mission statement of the comic comes to play Joe Keatinge achieved something very unique in not only creating an original super hero but also launching a comic book series that I hope to see lasts for a long time. It helps that he has a fantastic talent in Andre Szymanwocz. One look at his art and you can tell he loves drawing this comic. It’s based in reality but still has a comic book feel to it that is made to shine when colored by Jason Lewis, who has made this comic stand out with colors not normally associated with super hero types, like light blues, yellows, and mostly pinks. I don’t know how the trade is going to be formatted but there’s a bonus to picking up this comic book monthly. Besides the funny and informative recap page at the beginning and the fun letters pages, which always has cool recommendations regarding comics, movies, tv, books, and music, the reader also gets short comics stories. One is called Tiger Lawyer, by Ryan Ferrier and Vic Malhotra, which is exactly as it sounds and the other is called Baby Girl in the Lost Treasure of the Afrika Korps, by Matt Heistand, Evin Dempsey, Dan Fifield, and David Hahn, which is about a spy named Baby Girl who has a particular set of skills that she isn’t afraid to use. Over all it’s a fun package and it’s all for 3 bucks. You can beat that. Hell Yeah!